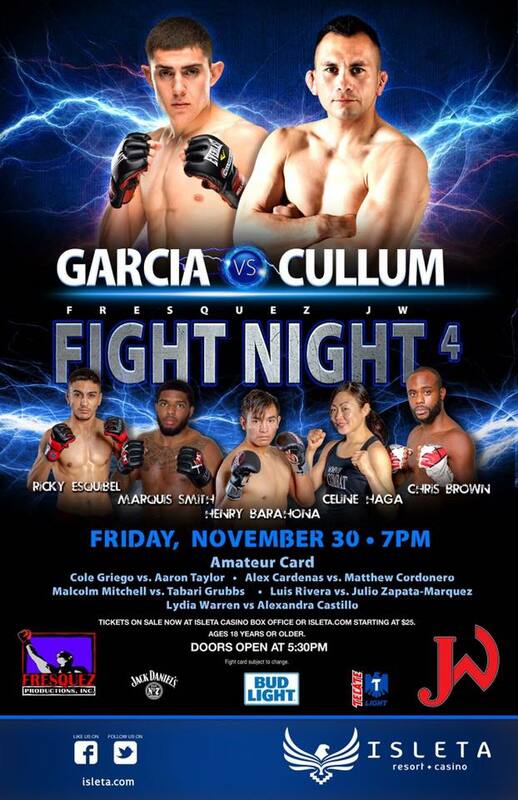 This Friday, November 30, Isleta Resort & Casino, just south of Albuquerque, NM, will host Fresquez Productions Fight Night 4. The event will be an eight bout MMA card, with three amateur and five professionals matches. The headliner, a bantamweight contest, Steve “Mean Machine” Garcia vs. Abel “The Silent Assassin” Cullum. Garcia is a Bellator vet with 71% of his wins by knockout. The “Mean Machine”, a JacksonWink trained fighter, looks to rebound from a June submission loss to Aalon Cruz. Cullum is a former KOTC champion who competed in a DREAM Grand Prix, and fights out of Force of 1 Martial Arts in Clovis, NM. “The Silent Assassin” has won three in a row, all by submission, something like 14 of 19 finishes. The co-main event is one with a backstory. Flyweights Rickey Esquible and Marquis Smith both came up through the New Mexico amateur scene but have never crossed paths in the cage. 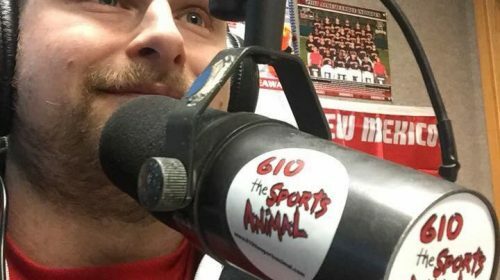 So, when both had trouble finding fights as pros, Smith, who now trains in San Antonio, TX, admits to using the power of social media to antagonize Esquible to achieve his goal of having a fight back in his hometown. Esquible is a JacksonWink fighter with all his wins by submission, while Smith, who has trained under Pete Spratt, has wins by knockout and submission. At strawweight, Invicta FC vets battle as Kali “Pop Tart” Robbins battles Celine Haga. Robbins has four of her five wins by submission while Haga has seven of 11 wins by submission. Mike Winkeljohn trained fighter, “The Future” Chris Brown, faces short notice opponent Warren Stewart. Brown looks to rebound from his first loss in MMA, a split decision to Thomas Gifford. Stewart is a 37-fight vet from Austin, TX. Also, on short notice Dallas, Texas native Andrew Sosa, who has over 20 professional fights between Muay Thai and MMA, faces heavy handed JacksonWink fighter Henry “Boom Boom” Barahona. Tags: Abel Cullum, JacksonWink, Pete Spratt, Steve Garcia Jr.